An Englishman, James Moore, won the world's first bicycle road race (from Paris to Rouen) in 1869 but he had moved to France with his parents when he was four and spoke English with a heavy French accent. In the years afterwards the English-speaking world was not much of a factor and the sport was only covered by a few journalists outside of the European continent. But there has been a sea-change, with American, Australian and British Tour de France winners and World Champions on the road (in addition to track success). William Fotheringham of the UK's the Guardian newspaper has watched and recorded events for more than two decades and in his latest book, “Racing Hard,” looks back over an era. And there is a lot of good stuff in this book (well, except for photos—nary a one). The author had to pick through no fewer than 2,500 pieces to make his selection and discovered constant themes emerging. These are not surprising to the casual fan, although the focus does tend more on the British rather than English-speaking component : Lance Armstrong, doping, the Tour de France, the Festina scandal, the emergence of British cyclists at the Tour, Britain and the Olympics. The first six chapters deal with the Tour de France and the reader is in the fortunate position that the stories are not merely reprints but include comments by Fotheringham looking back from today's vantage point. It is clear that some of the stories had to be rushed to meet a deadline. But there is enormous charm in the opening where describes watching the tour on July 13, 2001—the day before Bastille Day-- in an obscure hamlet named Mattexey in France, where the locals had set up trestle tables to sell refreshments to visitors, an opportunity for villagers to meet each other and enjoy a day when the world was focused, however briefly, for a moment of this corner of la France profonde. Finding the special angle is always a challenge and Fotheringham is creative in his approach. His account of the ill-fated Linda McCartney Foods team is about the difficulties the staff faced in maintaining a vegetarian diet for the athletes, although as time showed that was to be the least of the team's worries. It was disbanded at the start of 2001 leaving its entire line-up of racers (including young Bradley Wiggins) stranded. 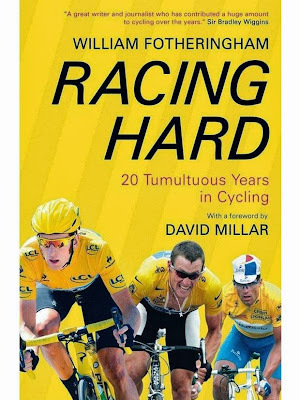 The book recounts the stories, well-known to many of us, of those Tours from then until 2012, ending the section not with the triumph of Wiggins that July but with the television interview in January 2013 in which Lance Armstrong admitted his doping past to Oprah Winfrey. Doping is a recurrent theme in the book, sometimes directly as in the events surrounding the Festina team in 1998 or on reflection as Fotheringham looks back. Defenders of pro cycling have a difficult task as once it became apparent just how widespread doping was in the sport the excuses that only minor riders doped or that only star riders did it exceptionally were thin. The argument that “everyone did it” is pretty true but no excuse. The author is matter-of-fact in his reporting and does not see everything in black-and-white. 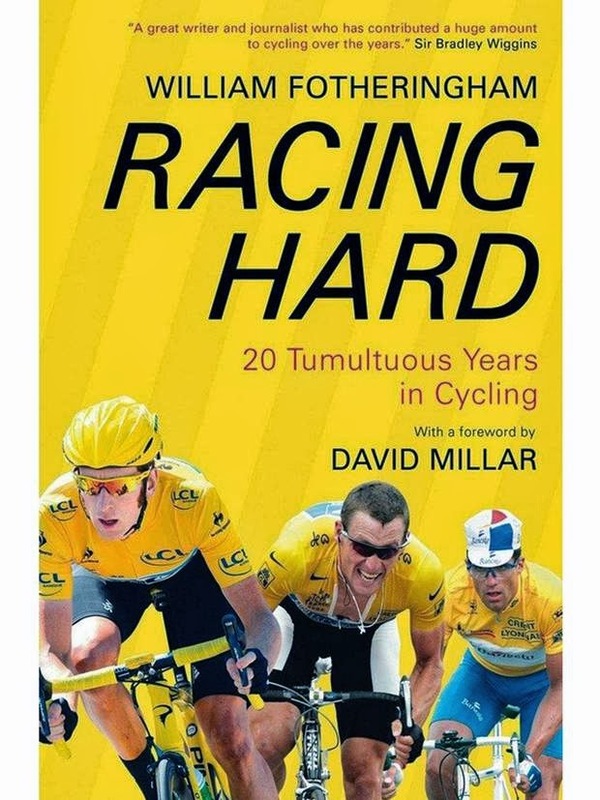 The first journalist to interview David Millar in-depth after his doping admission, Fotheringham has sympathy but does not offer suggestions as to the sport's future course. Much happier is the second half of the book where Mr. Fotheringham's patriotic heart is all a-glow as the British, whose road racing history in continental Europe had seemed to something out of Monty Python with the exception of a few talented and determined individuals, are in the ascendant on the track and have two Tour de France victories (although the book does not include Froome's win, having been published in June this year) in the bag. New actors appear, including the British Cycling organization, the brilliant Chris Hoy and a raft of super women as well. The Olympics are the playing field here and the writing betrays Fotheringham's great pleasure at being present. “Racing Hard” is about, well, racing hard but also has much that is thoughtful and empathetic. A journalist must keep distance and so William Fotheringham has but at the same time the reader senses his affection for those he writes about, his love of the sport and his pride in the accomplishments of British riders. A commendable collection and a fine read, even given the inescapable presence of doping. Suggested retail price: 12.99 GBP, available through on-line retailers as well.